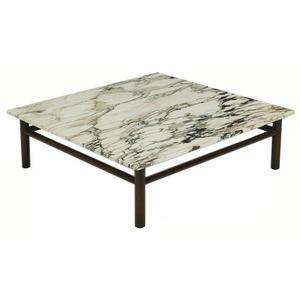 Square Cocktail table with marble top. Dowel form base with stretchers to each side, a typical Robsjohn-Gibbings form for Widdicomb in this period. Similar tables were also offered in rectangular and round profiles. Very vibrant predominantly white marble with strong black veining and some copper/bronze strands. 40�w x 40�d x 12�h. Very Good original condition. Marble is in excellent condition, with no marks nor stains. The corners have softened slightly over time. There are no chips or cracks to the marble top. These tables are often seen with replacement marble, often not in keeping with the original Robsjohn-Gibbings white with black motif. We are confident this is the original marble. Table base retains its original finish, which shows some wear consistent with 57+ years of use. Table base has been cleaned, touched up, and waxed. Signed with aqua Widdicomb "Modern Originals" decal; marble top stenciled "Made in Italy."